The humble kitchen is arguably the most visited room in the home and is where everyone gathers to eat and talk. It’s the heart of the home, a room that knows no bounds and feels safe to all who enter it. Not everyone is a fan of the kitchen however, some are almost allergic to the kitchen. But there’s no excuse, even if you don’t cook you should still help those who are or make the drinks when it comes to mealtimes. Below are 15 stunning kitchens that will make anyone become a top chef, even those allergic to the kitchen! This stunning kitchen is both modern and homely with jar inspired lighting and fantastic display cabinets for posts and pans. The white finish gives is a new feel, even though the style isn’t 100% modern. This industrial style kitchen is amazing, it incorporates the buildings looks into the overall style of the room. The use of 2 materials on the work surfaces almost creates the illusion of 2 separate spaces on the worktop, incredible. This room is very modern with the addition of 2 dining areas at both sides of the room. The dark wooden colours make the room more inviting and the heavy metals give the room a shine and sparkle, leaving you wanting more. This rather bright kitchen may only use 1 main colour to catch the eye, but the earthy tone makes the room feel quite natural and very relaxing. The brightness of the colour gives life to the room and the simplicity of the layout creates more space. If you’re one to light the more homely feel then you’ll love this kitchen style. Using mainly whites mean that the room almost glows with light. Instead of having a permanent fixture in the middle these guys have opted for a large and tell table that can be moved if needed. Great for ease of use. This rather futuristic looking kitchen creates a bar like feel, great for younger homeowners and those who like quirky decor. The addition of the television makes it a great place to cook and hang out with friends and family. This rather bright and simplistic room is a fantastic space for any home, one that is crisp and clean. You wouldn’t want to spill anything in this kitchen, as it would ruin the sophisticated look. The double doors lead out into the garden, which is great for summer. Another stunning white kitchen here with the addition of slightly more formal furniture. This room is long, leaving enough room for guests to sit and chat whilst someone is cooking. This too leads into a garden, with even more space to relax. This kitchen is lightly more geared towards those who like things to be more traditional over modern. The wood used in the kitchen is light, so it’s not dark and dingy and feels fantastic when varnished. The large piece in the middle makes for a great dining table, with enough room for a large Sunday roast. Ignoring the random chicken on the floor, this kitchen is fantastic for those who like the rustic farm house style. The raised counter makes half of the kitchen look like a bar and the detailed marble counter tops are simply divine. This is yet another simplistic and modern kitchen which includes the addition of dark wooden units on the walls. In this kitchen the units are large and reach the ceiling in some areas, plenty of space to store utensils and pans. This kitchen is a great look and suits those who like the finer things in life. The creamy colours give the room a more luscious feel and the dashes of wood help to bring the room together. The lighting is also very unique and rather interesting, giving the room a little edge. 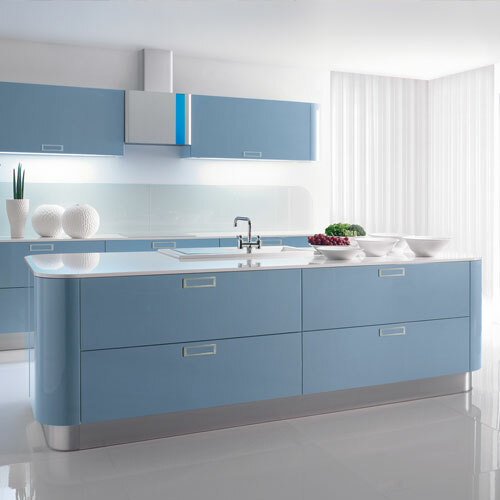 A very kitsch and modern look indeed, this kitchen has some real personality and is light and bold. Using a pastel blue makes the room softer on the eyes, like looking at clouds in the sky. This would certainly stop you from becoming stressed when cooking meals.